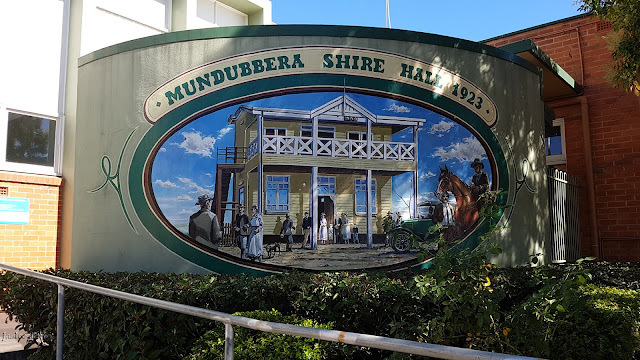 thoughts & happenings: Mundubbera, Queensland. 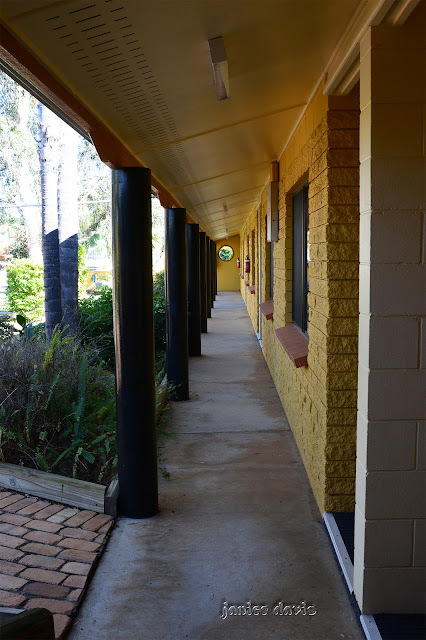 Mundubbera means Footsteps in the trees or Meeting Place of the waters in local Aboriginal language. European settlement took place in the late 1840's. Closer settlement, involving migrants from Germany, Britain and the Netherlands, did not take place until the early 1900's and the town was established in it's existing site prior to World War1. The railway arrived in 1914. Mundubbera Post Office opened by July 1, 1912. Henry Zipf planted the first citrus orchards in 1933 and established Mundubbera as a major producer of export citrus. This Mandarin is in a caravan park not far from the Motel. Trusting soles in Mudubbera with this sign in the main street. Walked around inside the shop not a sole about. This mural is in the main street, a water tank certainly not an eyesore. The above sign was in the toilet on the glass of the motel. On the way to the dinning room. Below the outside dinning room, we ate in the inside dinning room. The building was L shaped so there was another wing to the left. 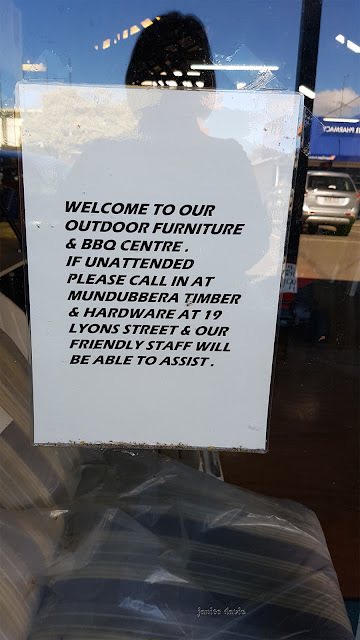 It looks like a very quiet place. I am so used to visit very tourist places that I find these locations very peaceful. 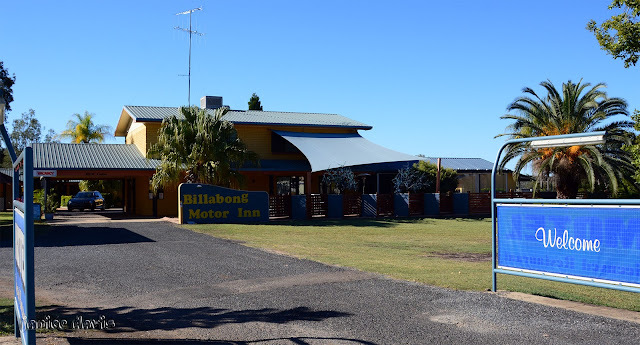 Country towns where everyone know everyone - they help all who pass their way and it was peaceful there. Olá, local bem escolhido, é belo e tranquilo certamente, indicado para passar uns dias calmos e serenos. 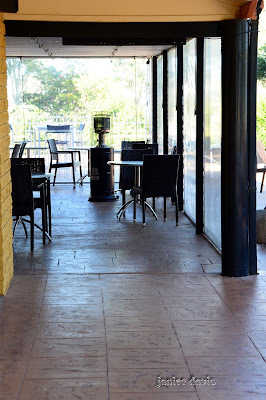 All seemed peaceful when we stayed there, that made our stay pleasant. Honesty and trust like that are lovely to see/hear about. And the sign about the frogs. Llama la atención ese mandarin gigante, cuando dentro de los cítricos es de los más pequeños. Citrus fruit is small as you say - and we have 'big' things like the mandarin scattered about the country. So often your posts have reminded me of California's Central Valley-- the way it was a half century ago. Giant oranges and all! SO nice to see new things that remind me of pleasant old things. Well that is lovely then being nice memory. Often I've heard people say - such and such reminds me of 'another place'. Those worlds apart it's true. Graham, the frog, is far safer than Robert, the redback, or Sammy, the Joe Blake snake! Country folk have a great sense of humour, political correctness is thrown out with the dish water - ha ha. Adding a bit of spice does you well, Margaret..............keep up the mirth. Thanks Colin - political correctness, it's a real pity we have it. I've been waiting for the first photo of something 'big'. Great story about Graham. The mural on the water tank is terrific. 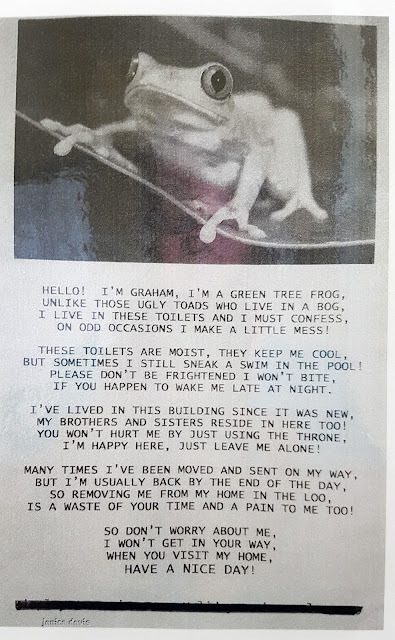 Ha!, always find something big on our travels, not often we don't.The poem is certainly a good one re frog. I like the water tank mural, very nice way to disguise it. I like Graham's poem too. When I first came across the water tank didn't realise it was one - it looks lovely. Very nice indeed, and I can't believe it, the giant pumkpin, ha ha. Bob, it's a mandarin :) and it's a big one. 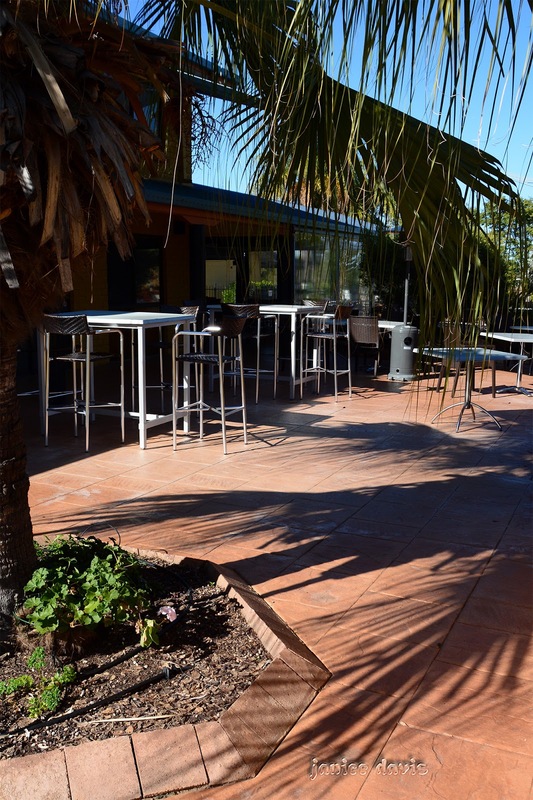 Mundubbera comes across as a very hospitable & pretty town to visit! The mural on the tank is great & I loved the huge mandarin orange! Sweet town as many are when you stay in them awhile. 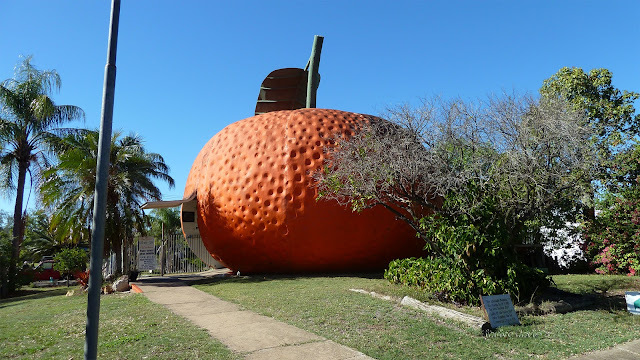 It is a big mandarin. The water tank mural is very well done! I think public art really brings so much personality to country towns. I rather like town murals as they often tell us of the story of their town. Melbourne is familiar name to my ears as me and mom(LATE) used to see series of cricket matches live from here on t.v . Wonderful place Margaret dear ! Thank you for sharing some history along the beautiful pics ,it paints a accurate image of city. 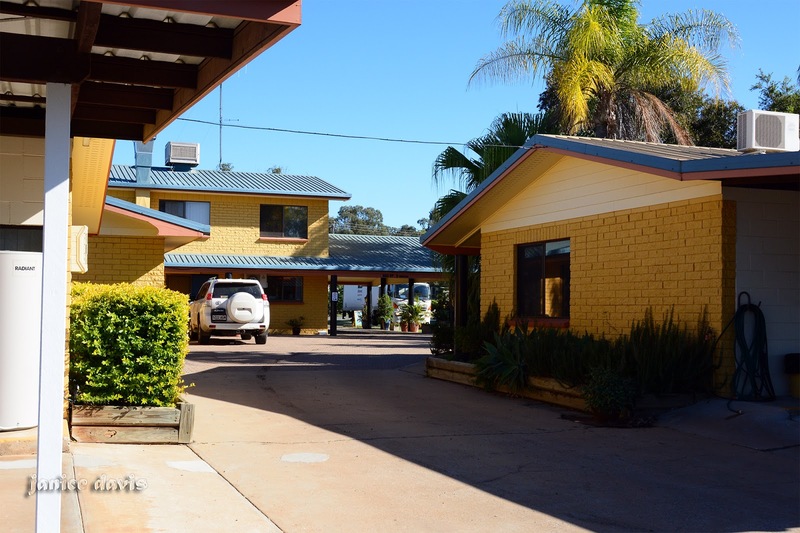 Millmerran Village Caravan Park, Q'land.